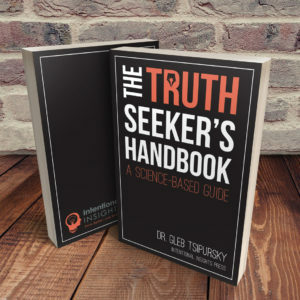 Dr. Gleb Tsipursky has published a number of books, including two national bestsellers, The Truth-Seeker's Handbook: A Science-Based Guide and Find Your Purpose Using Science. How do you know whether something is true? How do you convince others to believe the facts? Research shows that the human mind is prone to making thinking errors – predictable mistakes that cause us to believe comfortable lies over inconvenient truths. These errors leave us vulnerable to making decisions based on false beliefs, leading to disastrous consequences for our personal lives, relationships, careers, civic and political engagement, and for our society as a whole. Fortunately, cognitive and behavioral scientists have uncovered many useful strategies for overcoming our mental flaws. This book presents a variety of research-based tools for ensuring that our beliefs are aligned with reality. With examples from daily life and an engaging style, the book will provide you with the skills to avoid thinking errors and help others to do so, preventing disasters and facilitating success for yourself, those you care about, and our society. Check out the full information about this book at this link. This workbook helps you live a meaningful life by finding and living your purpose using science-based strategies. It combines an engaging narrative, stories from people's lives, and research-informed exercises and worksheets designed to help you cultivate a rich sense of meaning and purpose. Science really can answer life's big questions, such as "why am I here," as shown by a wave of recent research in psychology, cognitive neuroscience, and medicine. The research highlights that such questions are vital, since people who lack a rich sense of purpose have significantly worse mental and physical health. The vast majority of guidance on meaning and purpose comes from traditional sources such as cultural heritage and religion. While this guidance works for some, unfortunately traditional sources of meaning and purpose do not speak nearly so well to others who want an evidence-based approach in which they can be truly confident. This workbook offers science-based strategies and data-driven tools to help you improve your mental and physical health by finding the meaning of your life and thus living with a purpose. 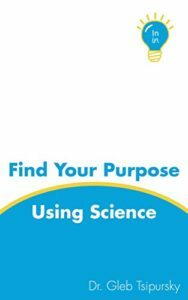 Read this book to find your purpose using science! Find out more information about this book at this link.